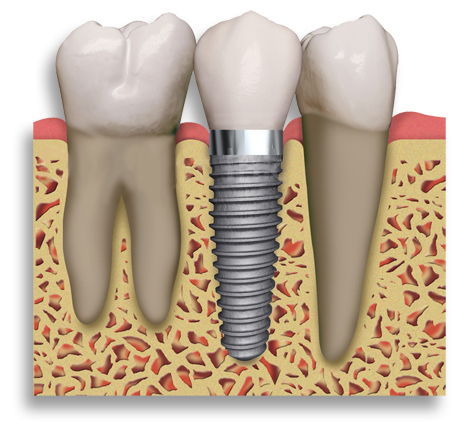 Dental Implants: A dental implant is an option to replace a missing tooth. In this procedure, a small titanium shaft is surgically implanted into the bone and allowed to set. The bone grows around it, forming a tight connection, which additionally slows or stops the bone loss that occurs when the root of a natural tooth is missing. Once the implant is firmly set in the mouth, the dentist then will attach the replacement tooth onto the top of the implant. This solution does not stress the surrounding teeth for support or increase the risk of decay like conventional fixed bridge work. If the crown portion of the implant were to wear out, another one could be made easily. Your overall health may affect the success rate of dental implants. Smoking and alcohol use seem to decrease the long term success of implants. Poor oral hygiene is a large contributing factorto why some implants fail. It is important to floss and brush around the fixtures at least twice a day. Additional cleanings of up to four times per year by a hygienist are sometimes necessary to ensure that you retain healthy implants and gums. Success rates vary, depending on where in the jaw the implants are placed but, in general, dental implants have a success rate of up to 98%. With proper care, implants can last a lifetime. In most cases, anyone healthy enough to undergo a routine dental extraction or oral surgery can be considered for an implant procedure. Patients should have healthy gums and enough bone to hold the implant. They also must be committed to good oral hygiene and regular dental visits. Heavy smokers, people suffering from uncontrolled chronic disorders—such as diabetes or heart disease—or patients who have had radiation therapy to the head/neck area need to be evaluated on an individual basis. More dental insurance companies are starting to pay for a percentage of the care. Detailed questions about your individual needs and how they relate to your insurance should be discussed with our administrative team and your insurance provider. Most people who have received dental implants say that there is very little discomfort involved in the procedure. Local anesthesia is used during the procedure, and most patients report that implant placements involve less discomfort than a tooth extraction. Sedation is also an option for the placement of an implant. Implants can also be used to support an implant bridge. This is an alternative to partial dentures, and has several advantages. First, there is a smaller adjustment period for the patient once the work is completed. The patient will not feel bulky metal or plastic supports, only teeth. Second, this slows the bone loss due to missing teeth. Third, there is no discomfort or difficulty in eating. Fourth, and best of all, they don’t have to be taken out and cleaned all the time.